Over the years I have become desensitized to the circus I have created. There is much craziness at times. And what is strange to some is usually par for the course 'round here. I have learned to overlook the small stuff because there is plenty of big stuff to keep me busy. And I have done my best to let my munchkins be themselves. Does it really matter if LLG dresses himself with a clip on tie and sandals with socks? Who am I to tell him what looks nice? When they play and create I try with all my might to let it be. Not to interfere. To let them dream big. Naturally there are moments I have to guide them. There are times I have to dress them. There are times I can't WAIT to clean up their creations. Their imaginations can make for tough housekeeping. I thrive in peaceful, serene, UNCLUTTERED spaces. Oh Nellie these are rare at times. The upside to this "let it be" battle is those moments when I see how differently they see the world. Sadly there are many days I don't stop to smell these roses. But the other day I did. On my way up the stairs my end table lamp caught my eye. What on Earth? Were there figures in there? Since when? And why? I felt the need to examine the situation more closely. And I also felt the need to question the closest munchkin. Purely for entertainment value. "Are these figures in here for any particular reason?" Closest munchkin turns and nonchalantly responds, " Oh, those guys are in the chamber of evil." Ah, forgive me. What a perfect chamber. How could I never have noticed that before? 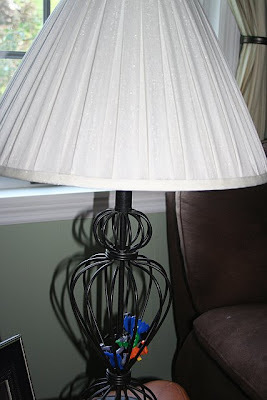 And rather than be worried about my lamp looking clean or about where those figures really belonged I walked right by them. Well, I photographed them first. And then I let them suffer in the chamber of evil. Thank heavens for munchkins. They truly have a way of seeing the world in a different light. And when it isn't making my clutter radar go nutty it's truly refreshing. Wishing you a refreshing Wednesday! Our Memorial Day was small town. It was "old school". 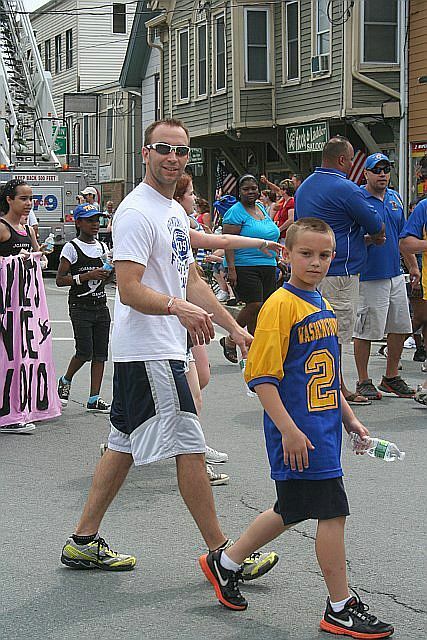 My two boy munchkins marched in the town parade to support the football program. Hubby was their fearless leader. The girls watched from the curb with all our small town peeps. We cheered and clapped. We waved to everyone we knew as they marched by. 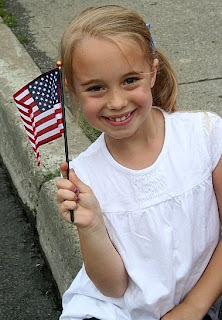 Moopa was delighted and the Gymnastics Queen collected candy that was tossed from the parade marchers. She declared it the "best parade ever" as she ingested lollipops and chewed her many pieces of Double Bubble. When we returned home we fired up the grill. Hubby set out our giant inflatable water slide. We listened to the radio. Yes, I said radio. Memorial Day means the "Top 500 Rock Songs of All Time Countdown". I remember bumming around my backyard with the grill smoking and my dad laying by the pool. And the top 500 was on the radio. Every year. I insisted my munchkins experience the same laid back unofficial start to summer. And so they splashed around on the water slide. They played in the yard. They took little breaks for chips and dip up on the deck. And they patiently waited for Rihanna to surface on the countdown. But our day was all about kickin' it old school. It was about small town livin', family time and barbecuing in the backyard. And so the radio was just the classics. They still rocked. Static reception and all. Today is a kick back and barbecue day. A hooray we have no work or school day. 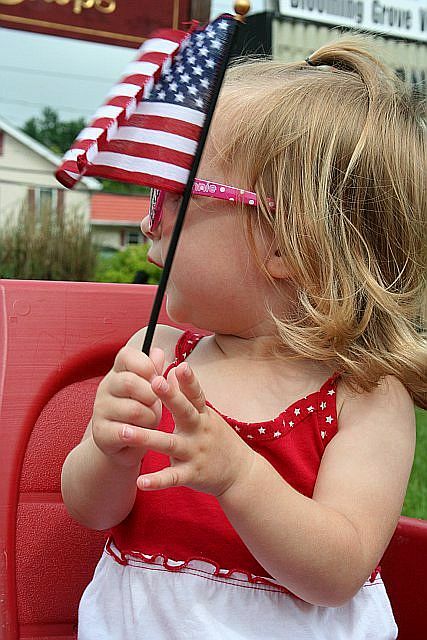 A remember WHY we have no work or school day. We have so much to remember and be thankful for. 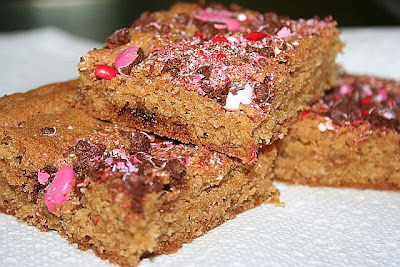 I wish I could bring an entire tray of these crispy squares to every soldier and their family. Just to say thank you. Because you rock. 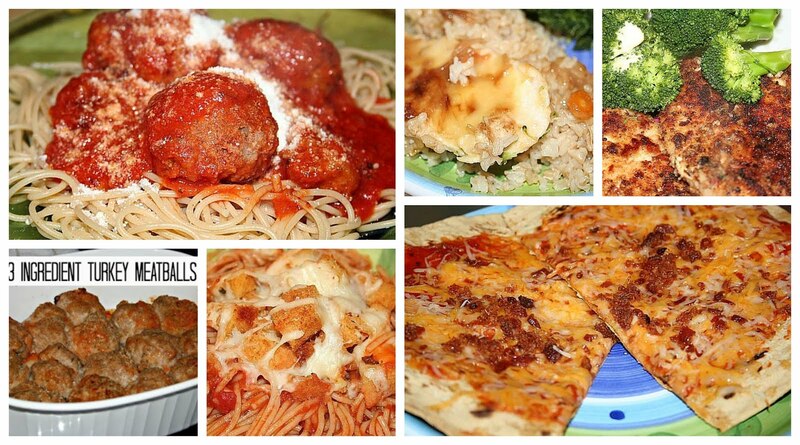 This recipe is a last minute, "we have to bring something!" dessert. It's an easy twist on crispy squares and it doesn't require the oven. Easy and no oven. I love the good ole' win-win. Grease and set aside 9x13 inch baking dish. Melt butter in large saucepan over low heat. Once melted add marshmallows. Stir until smooth. Remove from heat and add crispy rice and peanut butter. 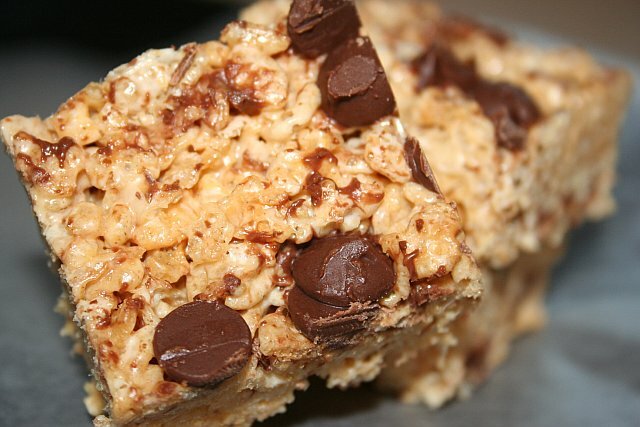 Stir until crispy rice is well coated in peanut butter and marshmallow. Add half chocolate chips and stir in, set aside other half. Press crispy rice mixture firmly into pan using flat, greased spatula. 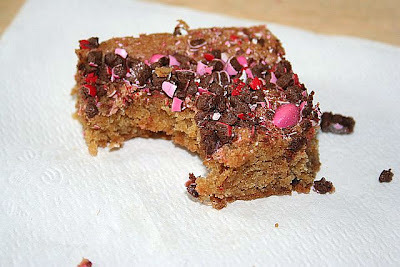 Sprinkle remaining chocolate chips over top. Press firmly to set. I refrigerate until firm and then cut and serve. If you are blessed to have central air and you are organized enough to make ahead and not last minute, refrigeration is optional. Ah, Memorial Day weekend. The official start of summer. Winter is finally behind us. I have such fond memories of this time of year. Schoolwork in June was minimal and time in class was spent socializing and playing games. There was anticipation of sunny, lazy days. Long nights with friends. Bedtimes were later. Time was unstructured. Even now I can feel the excitement stirring in my munchkins as the school year winds down. It's contagious. Such a refreshing time of year. And now, I embark on another 5 ? Friday. My last one before my official summer begins. All the time. I have a tendency to be frazzled when my life gets stressful. Being late, a cluttered house, the bank account getting low...all are circumstances that can get under my skin. Most days I roll with the punches. I breathe. I laugh. I hug. But there are many times I overreact and it warrants an apology. And I have no shame in apologizing to my munchkins. They are people. Albeit tiny people, but people just the same. And I need them to know I'm accountable for how I behave. Just as they are. Learning to say "I'm sorry" is no easy task. But it's such an important life lesson. Yikes. You caught me. My nails are a classy color of chipped dark pink polish. I treated myself to a manicure last weekend and I'm not ready to say goodbye. Even though the polish quit on me days ago. I always swore I would never walk around with nails in this condition. It takes all of two minutes to remove the polish. If you catch me in sandals with unpolished, gnarly looking toenails please punch me in the forehead. Do not let me throw in the towel at 31 years old. I need to make it to at least 35 before I slack on the grooming. My Mom was cool. She was easy about us staying home if we weren't well. But we had to be sick. There had to be signs of sickness. My mom is a phenomenal caretaker. When I was a kid she wasn't real mushy with the hugs and kisses but she was a killer nurse. Love and warmth are washing over me as I remember the food deliveries and naps on the couch. I bought a quilt last year. Does a quilt count? Before that I can't remember. Which translates to I hardly ever buy bedding for myself. But I do have a hall closet door I can barely shut because the closet is overstuffed with toddler bedding, sports sheets and Handy Manny comforters. When I'm 35 and I officially throw in the towel on grooming I'll also start using the Mickey Mouse sheets. I'll give up all around the board. Live a simple existence. Hubby is currently planning his escape plan. I should save him the trouble. There is no escape. 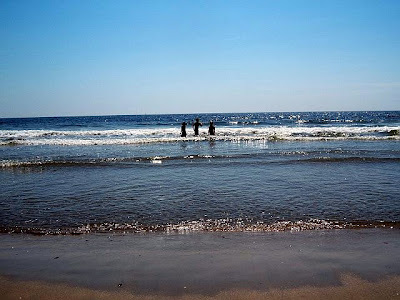 Other than emailing and blogging I don't do much website surfing. There is barely time in my day to remove nail polish. I have no business surfing the net. But I have been known to stay current with important events via People.com. Summer at the beach. Is there anything better? Last year LLG made a pretty penny selling his tomato cups. His garden yielded more cherry tomatoes than we could ingest. And so we sold them. To family and friends of course. We filled clear plastic cups with tomatoes and we printed labels. Each cup was $0.50. Once his business got rolling he was making weekly deliveries to family members. A win-win. The tomato garden maintenance kept him busy, he learned about supply and demand and he made some money. Oh, and everyone enjoyed tomatoes. All summer. You can read about our entrepreneurship here: Little Entrepreneurs. 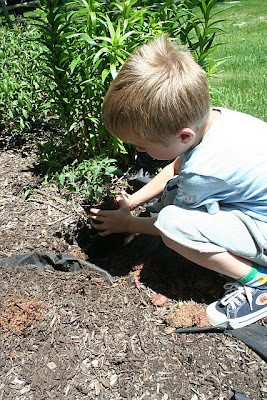 The weather is finally garden friendly here and I knew we needed to get LLG's garden planted. No need to disappoint his customer base awaiting summer deliveries. Yesterday he came running off his kindergarten bus and I had a surprise for him. Tomato plants. And Miracle Grow. And a garden shovel. He spent the next hour enthusiastically planting his small garden. Ah, let me rephrase. WE spent the next hour planting his garden. His job is now to remember to water the plants. My job is to remember to remind him. And when they tomatoes are ripe we shall package them up nice and cute. And raise the price to $0.75/cup for inflation. Ah the almighty dance recital. It is that time of year. I have seen many a munchkins in their finest recital costumes scampering around town. My parents will never know how thankful I am that they sat through those recitals. Hours and hours of dance routines. And I was in just one. For about three minutes. I am thankful because I sit through four hour gymnastics meets and watch my little girl compete for all of four minutes. I've averaged it at one minute an hour. Amazing how we can only understand all our parents have done for us until we're a parent. 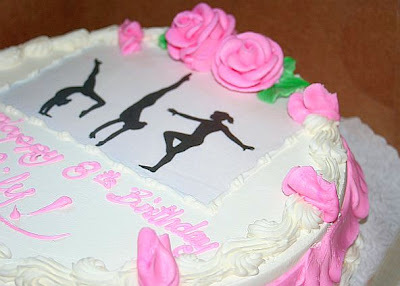 Anyhow, with dance recital season upon us, I was thrilled to get an email with this fabulous cake. This picture was taken in my dear friend's Kimmy's kitchen. This cake was made from scratch, by her. Time consuming and very special to celebrate her daughter's 1st dance recital. Together with the flowers and trophy I would swear I was flipping through Country Living Magazine. Truly picture perfect. 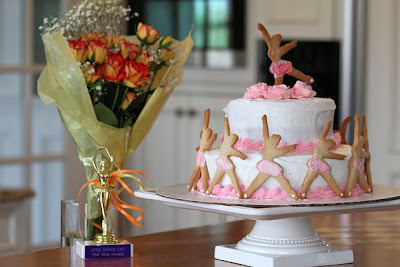 A fabulous idea to make a double-decker cake adorned with ballerina cookies. And trimmed with pink frosting. My friend Kimmy is an artist. She is a "Jack of many trades". She bakes, keeps her house and takes the most breath taking photographs. Oh, and she's a doctor. She is the same wonderful friend who erased five years from my face with Botox and Juvederm. How she finds the time to be so fabulous I'll never know. But how refreshing to know we all know Moms like that, and they are so inspiring. Wishing you the inspiration you need to do something wonderful this week! Mommyhood Footnote: My dear friend Kimmy also has a sister. She is one of my oldest friends and she is just as fabulous. Cheers to their mom, because she did one heck of a job instilling homemaking skills that put many of us to shame. And cheers to their dad, who introduced me to the world of hedge clipping. 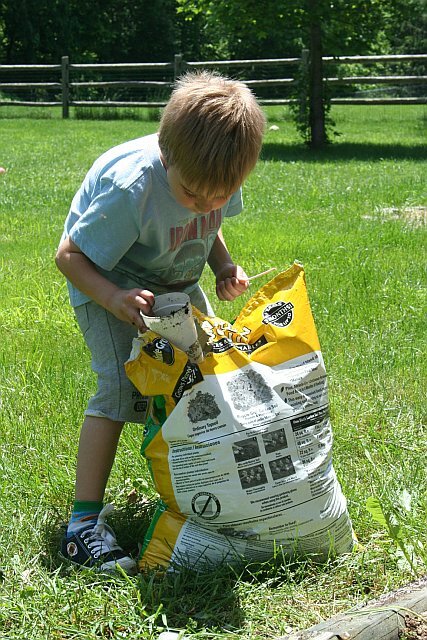 I'd go over for a playdate and end up landscaping his yard. I owe all my yard maintenance skills to him and my dearest dad. With the looks of my yard some days they should have made me mulch more often and clip more hedges. The past few days have been busy. Hectic. Chaotic. But somewhere in the hectic pace my little Gymnastics Queen was able to just be a kid. She's a kid every day, but on Saturday she was a kid the way I remember being a kid. 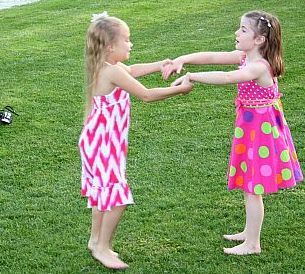 She played in the grass, barefoot, and huddled with her gymnastics friends. They circled around and held hands. And they were just being kids. 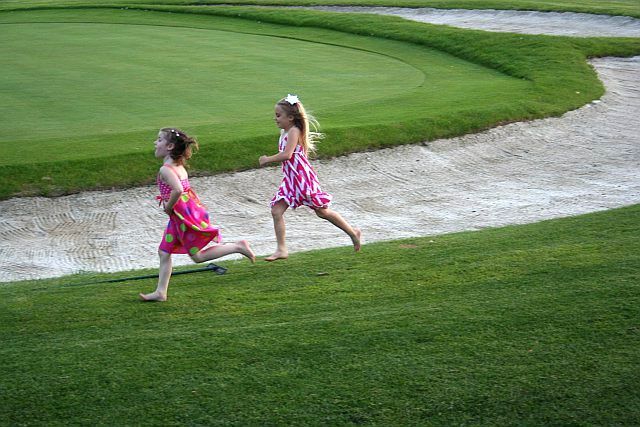 Uninterrupted, carefree kids. Her gymnastics banquet was one of our many weekend events. It was a relaxing and rewarding end to a competitive season. And it was most definitely the high point of my "run from here to there" weekend. A complete breath of fresh air. Watching those moments keeps the crazy in perspective. And I am so very grateful for every one of those "keep the perspective" moments. Wishing you many of them this week! Another Friday, here at last! I would breathe a sigh of relief but I have agate from trying to plan this weekend. Saturday is a flurry of activities. Hubby and I will be like ships passing in the night as we scamper around to gymnastics, golf, banquets and whatever else pops into our day. Does anything else want to pop in? Jump right in, the water is warm in this circus. We are a well-oiled chaotic machine. Without further ado I paste the questions from 5 ? Friday, the coolest blog hop hosted by My Little Life. Nope. Not unless we plan a movie night and even then I just pass out right after opening credits. He is responsible. He gets his rest. He is asleep by 10:30pm. At 10:30 pm my party is just getting started. The ice cream flavors are being selected and the recorded shows are being perused. Until 10:30 I'm tossing laundry around, writing notes for school and accomplishing anything else that needs to be done before the next morning. There is usually much to do because I work best under an "as needed" basis. I like a little something. Not all over scruff, but something somewhere. Does that make sense? Hubby shaves in what he calls a "soul patch". I am skilled at forgetting anything unpleasant. I'm such a happy person because anything I don't enjoy I either don't do or I forget I did it. Thus, I can't remember any vacation that wasn't a good time. This also could be because even if the vacation isn't going as planned, I'm always good for a laugh. Easy. The Pioneer Woman. Love her to bits. I love amusement parks. They are very amusing. Great for people watching and even better for food. I'm not a huge "rides" girl. After having munchkins I'm more than happy to sit out and sun myself while Hubby takes the bigger kids on rides. I hang with the babies. We walk and decompress. And while we walk and decompress we buy amusement park food. And we eat it before everyone is back and we have to share. 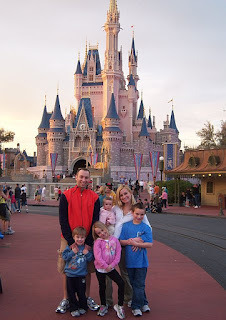 In honor of the vacation question, a picture of us in our favorite place! Disney! I've mentioned it was my daughter's 8th birthday recently. I have been feasting on leftover cake for days. It's quite unfortunate considering bathing suit season is basically here. What I've failed to mention is that the 1st of her two birthday cakes came from none other than the "Cake Boss". Yessir. You read that correctly. A few months ago Hubby mentioned he knew someone at work who knows someone who works for the Cake Boss. Hubby then casually tells me if we ever want a cake this guy can get us one. Just let him know a few weeks in advance. Uh, excuse me Hubby? WANT a cake? I wholeheartedly believed he deserved a dead arm for treating such a connection so casually. Instead of a dead arm I immediately informed Hubby exactly what I wanted for our daughter's birthday cake. I then called Hubby every Tuesday to inquire how the order was coming along. 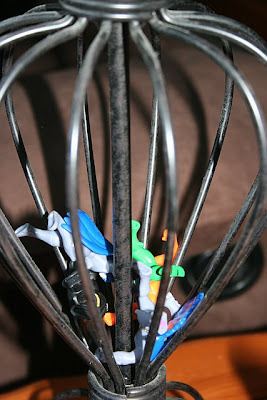 And so last week Hubby went to the Cake Boss to pick up our cake. He went with his friend who knows the Cake Boss' brother. That morning I had given Hubby my camera and told him to take pictures. He took none. He is a man and he is not keen on embarrassing himself like I am. He also told me he went through the back door and RIGHT into the kitchen. He didn't think pictures would be appropriate. Ugh. Add another dead arm to his tab. Anywho, the moral of the story is that I have the pleasure of reporting I have eaten cake from the "Cake Boss". My review of this cake is that it was phenomenal. It was fresh. The buttercream was just sweet enough and homemade. With love. But the real standout was the fudge filling. Oh Nellie. Calgon take me away and drop me in the middle of a Cake Boss cake with fudge filling. I will eat my way back to civilization. 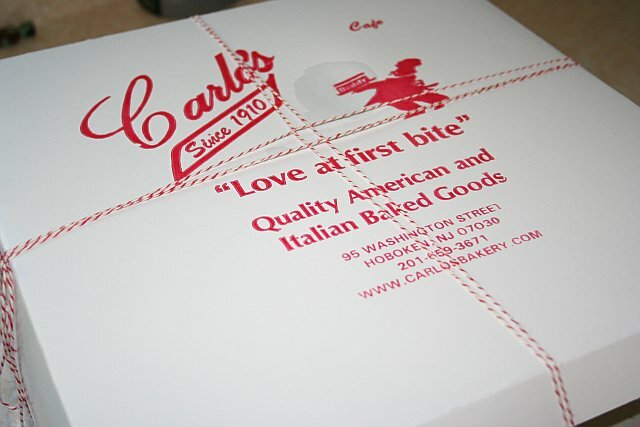 It goes without saying a cake from a bakery such as Carlo's is divine. But would I pay full price for this cake? As long as the buttercream icing is sweet and plentiful and the cake is fresh, I will take a cake from Price Chopper any day of the week. For 1/4 of the price. Sugar is sugar. I have always been a cheap date, and my dessert preference is no different. As long as I don't need an intricate design, less expensive works for me. After all, it just gets eaten. But if you have the chance to purchase anything from Carlo's bakery, I guarantee you will be pleased. More than pleased. We've all seen what these people can do from their show. I can now add that not only are the designs superb, the taste is as well. But for anyone not within Cake Boss vicinity, rest assured there are less expensive desserts (just as delicious) around every bend. 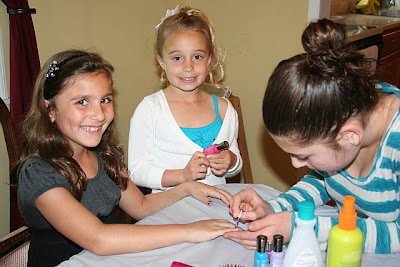 An Eighth Birthday: Makeover Party! A few weeks ago I had a discussion with my little Gymnastics Queen about her upcoming birthday. This discussion revolved around me trying to sell her a very "low key" party. In my mind I sounded convincing. The party I was describing sounded like a great time. A few friends and an outing such as a nail salon. My daughter listened quietly before she spoke. And when she spoke she chose her words carefully. Her words indicated that she felt she has been shafted in terms of birthday parties. The party when I made goodie bags for her cousins and brothers and hung a pinata wasn't up her alley? What about the rager at Michaels Craft Store last year? I thought Michaels was fabulous. Fabulously affordable. Anyhow, my baby girl is no fool. And she made some very valid points. She spends much of her time at gymnastics, reading and getting her homework done. And her brothers have had parties with "many people in the yard". She left me little room to argue. It was time I threw this chick a party. I work with a wonderful girl who just happens to be a Cosmetologist. My Gymnastics Queen has long said she wants to be a Cosmetologist when she grows up. And one day at work I had what Oprah describes as an "A-ha Moment". I asked my friend at work if she would be willing to come give several 8 year old girls "makeovers". We talked about hair and nail designs. We discussed what would be fast, fun and appropriate for 2nd graders. And so the "Makeover Party" was born. 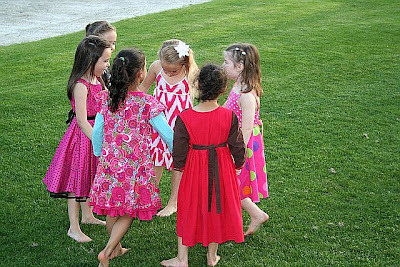 We invited 14 girls with the assumption at least 3 or 4 would regretfully decline. And so I had 14 girls with my daughter included. I was concerned this would be mass chaos because of the foggy memories I have of my older son's parties. I have tried to block those out. But the party was a roaring success. We set up a "makeover room" and the girls chose numbers when they arrived. Three at a time, starting at numbers 1,2 and 3 they went in for hair, nails and light makeup. The makeover room had a table with nail polish selection, nail decals, eyeshadow and lip gloss to choose from, fancy hair clips, glitter hair spray and the "hair chair". The girls waiting their turn played bingo, hot potato and freeze dance to super cool hip music. I had set up a raffle table with small prizes like lip gloss, chalk sets and hair accessories. The girls playing the games won raffle tickets for the raffle table. This kept them interested in playing the games. Which kept them from running wild. What they didn't know was that everyone would have a chance to choose a prize from the raffle table. But the more tickets you won the better your chances at being chosen to pick a prize first. And so in just under two and a half hours, we had 14 girls who played games, ate pizza and cake and had "makeovers". I also had one birthday girl who was over the moon about her super awesome, "big" party. And for me? I was just happy to have a nice group of girls, great friends to help, and leftover cake in the fridge. Today was a good day for this Mama. Two of my munchkins, a whopping 50%, accomplished big things. I couldn't be more proud. 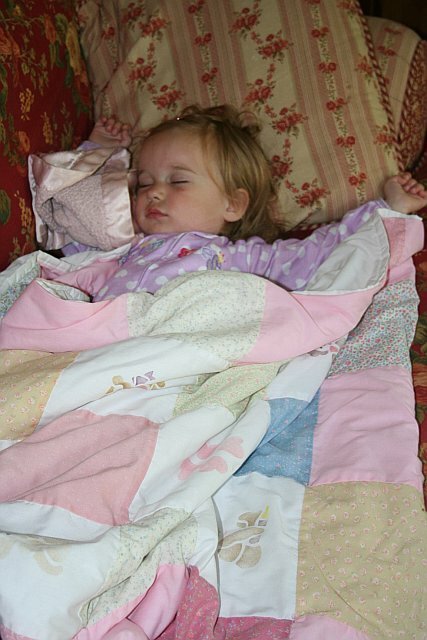 For the sake of my beauty sleep we will touch upon one accomplishment at a time. Another day I will detail our Gymnastics Meet. Man that was exciting. But today I will dive into running. 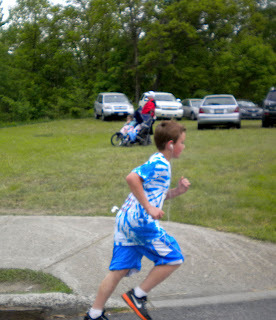 My almost 10 year old Sports Fanatic ran his first 5K this morning. This was a worry of mine. I signed him up with the hopes he would love it. But I prepared for the worst. Running is not his favorite past time. He reminds me of myself when I tried to walk "the mile" every year in P.E. But I must admit he has "blossomed" this year at the track. We take him twice a week, usually me on Tuesdays and Hubby on Thursdays. 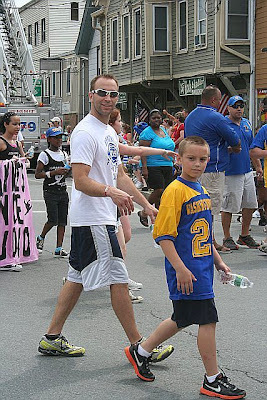 We started this last year as a way to prepare him for football season. He had his days he wanted to quit. Like we all do. A tough task to balance. And we don't always succeed. But today, as I was driving home from Gymnastics State Championships I received the call that my Sports Fanatic finished his 5K. 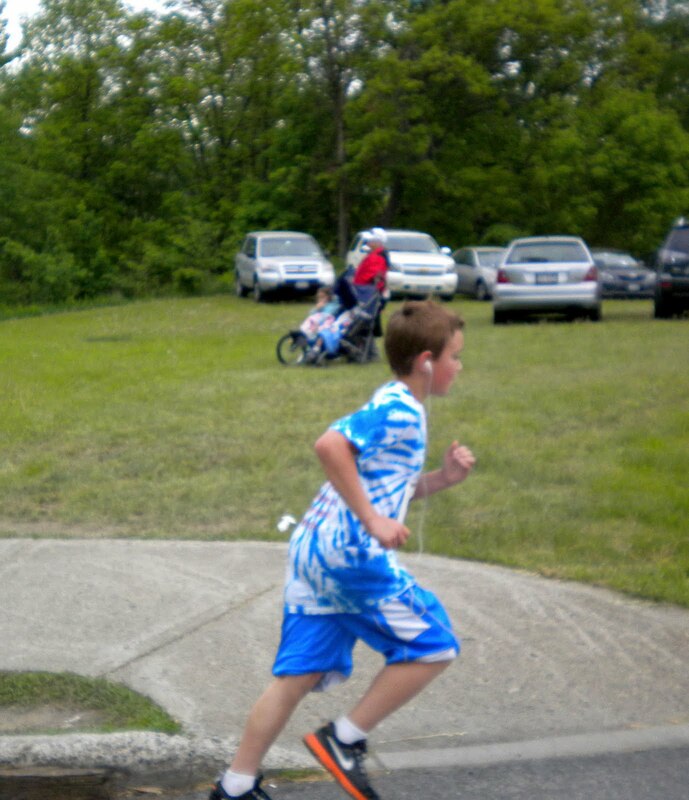 He finished faster than I ever would have imagined. And what mattered the most was that I knew how happy he was. He now knows he can do it. And man, that is a GREAT feeling. Realizing what he is capable of, when he works towards something and makes no excuses, is a lesson I have tried to teach him. But he needed to learn that one for himself. And today, he got it. And he made this Mama proud. But most importantly, he made HIMSELF proud. Life is all about the little things. Because at the end of the day they always turn out to be the big things. I clean regularly. I despise clutter. Dishes in the sink throw me into a tailspin. Counters peppered with papers, toys, pencils and garbage inhibit my abilty to focus. Basically I am a total pain in the arse if you live under my roof. You better watch where you leave your stuff because if I'm not in the mood its garbage. To the five other members of our household, I apologize. But I can't live with mess. The trouble I have with cleaning is that I neglect to clean anything I can't reach. I'm a vacuuming, windexing, bathroom cleaning, floor washing champion. But please do not look up. Do not examine my light fixtures, fans, curtains, wall hangings or cabinets. Today, for the second time since living in my current home I wiped down my kitchen fan and light fixture. I have lived here four years. And I can say with confidence that my mother, who abhors dirty light fixtures the way I abhor clutter, has been cleaning it on the sly. Because for two years of build up that sucker was pretty clean. Mom, another reason I love you. You constantly give without looking for any credit. And you also taught me all I know about cleaning. I'm sorry I have chosen to ignore anything that requires a chair, a significant reach or curtain removal. Have a wonderful Tuesday evening! Mother's Day passed without a blog devoted to Mother's Day. There is something MAJORLY wrong with this picture. I'm a "Mom Blogger". I blog about being a Mom. Mother's Day should be like Christmas in the "Mom Blogger" world. But, with surgery last Friday, flag football Sunday morning and work until Sunday night, a Mother's Day blog was never accomplished. I'm behind the eight ball. Again. Story of my mommy life. I just had to email the Gymnastics school because the yearbook page was due last Wednesday. And as I finished my doorbell rang. It was the man who services our boiler. He was at our neighbor's house working on their boiler. And since I'm 2 months overdue on a service he checked in. And my daughter's homework never was finished last week. Throw a wrench like surgery into my semi well-oiled routine and everything falls off track. And so with apology - I wish every Mother a very Happy Belated Mother's Day! The handmade cards and plants that come home from school are truly the most treasured in my home. I hope yours were plentiful. I truly feel being a mother is a privilege. It is also not for the faint of heart or the weak. You better show up every day or those tiny people will eat you alive. There are late nights and early mornings. Long days in the yard playing and piles of grass stained laundry. Endless school lunches and snacks. Playdates and birthday parties. Grocery stores. Cleaning. Grocery stores. Cleaning. School functions and clubs. Sports. Lessons. Heart to heart talks and instructions on how much toothpaste is appropriate for a single toothbrush. Power struggles with people who only stand as tall as your knees. There is noise. Lots of noise. Sibling rivalries and Wii battles. All clothes for Moms are purchased at discounted prices. And that's if there's even enough money left over to buy yourself new clothes. But man, those hugs are killer. And those wet kisses can make any day better. Wishing every Mom a year of killer hugs and plenty of wet kisses. If your munchkins are above the age of eight we'll just go with killer hugs and standard kisses! The "Mom Club" is one exclusive place, thanks for sharing it with me! 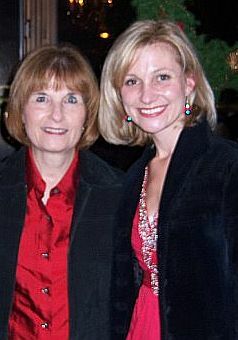 Me and My Totally Awesome Mom Who is one of the Most Generous and Selfless People I Know! Thanks for showing me the ropes Mom, you are one phenomenal example! My little Moopa has an eye condition called Strabismus. Strabismus is a condition much like lazy eye, and often they are confused. Strabismus is actually the medical term for being "cross eyed". I am no doctor. I am not an expert on Strabismus. I am just a mom who cares for my munchkins and devotes her existence to sending them into the world as loving, capable, generous people (hopefully with a sense of humor since boring people are boring). This post is purely to inform my lovely blog readers about our personal experience with Strabismus. When Moopa was seven months old, Hubby noticed Moopa's eyes were different. He asked me if I saw it. Mommy denial is a beautiful thing necessary to survival. I told him she was just a baby. All babies have funny eyes. But it got worse. I began noticing there were times she was looking at me, but her eyes weren't. One eye was turning in every now and again. But none of this was extremely obvious to anyone who wasn't in her company regularly. And she is such a good little Moopa. It was "her". It was endearing. Creepy at times, but endearing all the same. And then at her one year check up she failed an eye exam. This sent us to an Ophthalmologist. He told me it was an illusion. That the bridge of her nose was wide. I drove all the way to his office, arranging sitters and packing snacks to hear my daughter was an illusionist. Now, moms know what they know. And in my heart I KNEW it was not an illusion. If it were she would be giving David Blaine a run for his money. This is where I stipulate how important I feel it is to see pediatric doctors when you are dealing with pediatric conditions. I believe this first eye doctor was not equipped to examine a one year old baby, nor did he have the desire to treat a child that young. After seeing this doctor, I decided to wait a year. And then a dear friend (who I have blogged about) was visiting. She is one of Moopa's Godmothers. She is also a nurse. She urged me to get a second opinion. We agreed you only get two eyes. No time to leave issues and concerns unaddressed. And so I went back for her 18 month check up and my pediatricians agreed she had Strabismus. And they now referred a pediatric Ophthalmologist. We went to see Dr. Rush in November of 2010. Her office was child friendly and she had every gadget necessary to properly examine Moopa. I felt comfortable and I trusted her. She was on top of her eye examining game. And she diagnosed my Moopa with Strabismus. I was relieved because I was beginning to feel like a crazy person who enjoyed having my child get eye exams. Dr. Rush continued to monitor Moopa and it was determined the only correction for her was surgery. Strabismus is a muscular issue, and for my daughter surgery was the only way to correct it because her vision was perfect. Children are resilient. And I knew the younger the better because I didn't want to deal with school yard teasing or any vision loss in the future. I also didn't want to traumatize little Moopa with eye surgery when she was old enough to understand it. And so Friday morning we arrived at the hospital at 6am for Moopa's eye surgery. Mommy denial kept me calm. Moopa was so excited to be out with Mom, Dad and Grandpa all by herself. She behaved like it was "Moopa's Day Out". 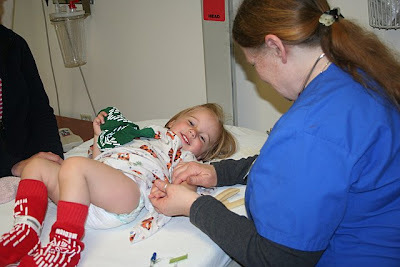 She was laughing, playing with nurses and running amuck. She was unfazed. 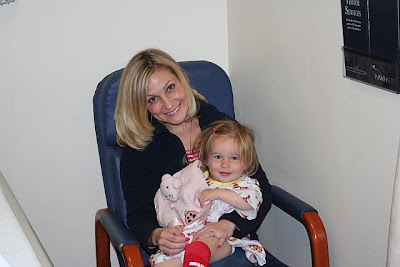 Moopa was soon prepped, given a drug to make her relaxed and even happier then she already was, and the nurse ran her IV. I then was allowed to accompany her into the operating room. 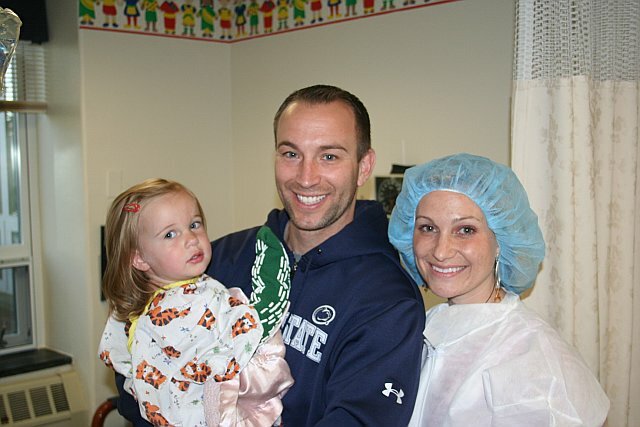 One person was able to stay with her while she received her anesthesia. Hubby would have loved to go but it would have meant a serious death match. Even though Moopa was quite entertaining on narcotics, this is where Mommy denial could no longer save me. My heart broke many times for my little Moops yesterday morning. Watching her go under anesthesia was just the beginning. 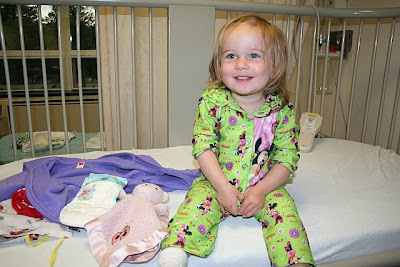 Nurses, IV's, anesthesia, recovery, sedatives and bloody eyes are a small snapshot of our day. The sight of her eyes after they were operated on was much worse than anything else. I can say with confidence this has been harder on us than it has been on her. We were home that afternoon and Moopa rested. She spent her afternoon sleeping off all the drugs. I took the snuggling opportunity to join her. And today, with eyes that would frighten Frankenstein, she is happily playing and running around like a crazy person. I will not include pictures of her eyes to spare you the nightmares. Trust me you don't want to see them. But in a week or so I'm looking forward to seeing her eyes work as they should. I cannot thank Dr. Rush enough. While approximately 30% of cases need more than one surgery, I am holding out hope Moopa will not be one of them. I am now looking forward to 10 days of attempting to administer eye drops and cold compresses. Gonna be a real hoot. Always an uphill battle with toddlers. I have very fond memories of my childhood. Vacations to Disney World, huge holidays, over the top birthdays, BBQ's with friends, late summer nights, and waking to the juke box Sunday mornings. Oh, and the blondies I bought with my school lunch in middle school. 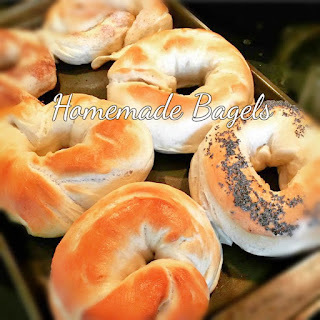 They are similar to the bagels from the cafeteria in high school. And yesterday, still coming off of my Easter sugar high, I decided I needed to bake some. It was time my munchkins met the ever-so-awesome blondie. chocolate chips, butterscotch chips, nuts as desired. I love a versatile dessert. Preheat oven to 350. Grease and flour 9x13 inch baking dish. Whisk butter and sugar in bowl. Add the egg and vanilla. When combined, add remaining ingredients and whisk well. Pour into pan and spread evenly. I sprinkle my chips on top, this time I crushed leftover Valentine M&M's. It is a cardinal sin in my house to throw away good chocolates. Bake for 20-25 minutes. I prefer all my dessert gooey so I check at the 20 minute mark. If middle is still just a bit raw, I remove from oven and let cool. I abhor dry baked goods. They make me cry. These are easy to cut, unlike a brownie. Makes them an excellent choice if you need to bring a dessert just about anywhere. If they even survive that long. My little Gymnastics Queen has had a cavity for a few months. When we went for our cleanings in August, we were informed we needed to come back and have a cavity filled. I envisioned Novocaine needles and drilling...and decided it was the perfect assignment for Hubby. But as the months passed I neglected to make the appointment. There is something about making phone calls for a purpose that my body naturally resists. A phone call just to B.S.? I'm all over it. But heavens forbid I need to call the insurance company, schedule an oil delivery or make an appointment. These tasks seem to go undone until they are needed. Such as when there is no heat or there are complaints of mouth pain. Since I neglected to schedule the dentist for my Gymnastics Queen over her school break like I intended, I had to take her out of school today. And since I was fairly certain I would not be back to make the kindergarten bus by 11:30am, LLG stayed home as well. So this morning we put my Sports Fanatic on the bus and the rest of us piled into the Mom Mobile for a trip to the dentist. Our dentist is a dear friend. We adore him. Our visits are enjoyable except for the minutes spent in his chair. With drills and sharp scary plaque picks. But today, with Novocaine needles and drills galore, my little girl didn't even flinch. Not one cry. Our dentist friend was ecstatic. I'm sure prior to our arrival he was having flashbacks about when my Sports Fanatic came in for a mini root canal three years ago. This tooth also started with a small cavity. But I already mentioned how long it takes me to call for appointments. Anyhow there was much thrashing. Equipment flew across the room. Afterwards our dentist friend explained the importance of children learning to be good patients. It was not a high point in my mommying career. But today my little girl hit it out of the park. She is one tough cookie. Our family name has been redeemed. Afterwards I happily took my good patient and the other two maniacs for groceries at Walmart. I spent the next hour trying to remember what to buy while Moopa cried for a piece of everything I placed in my cart and my Gymnastics Queen cried about her "tingly mouth". And then the only behaving child tripped on his shoelace and did a face plant into the side of the metal cart. We left Walmart with only 1/2 of what we needed, one black eye and many 1/2 opened packages of food courtesy of Moopa. And can I tell you I am not phased? These munchkins can not break me. But man am I looking forward to a more chill Tuesday. Hope yours is the same!